According to Charlotte Moore, “There is a real hunger from audiences to find out more about climate change and understand the facts,” I say Bull, Charlotte. Opinion polls repeatedly tell us that most people don’t give a toss about climate change. This new programme is nothing but a brazen attempt by the BBC to brainwash more gullible viewers. As for the old phoney Attenborough, what’s this nonsense about “conditions have changed far faster” than he ever imagined when he first started talking about the environment 20 years ago. The world’s climate is little different now to what it was twenty years ago, and it is absurd for Attenborough to claim otherwise. 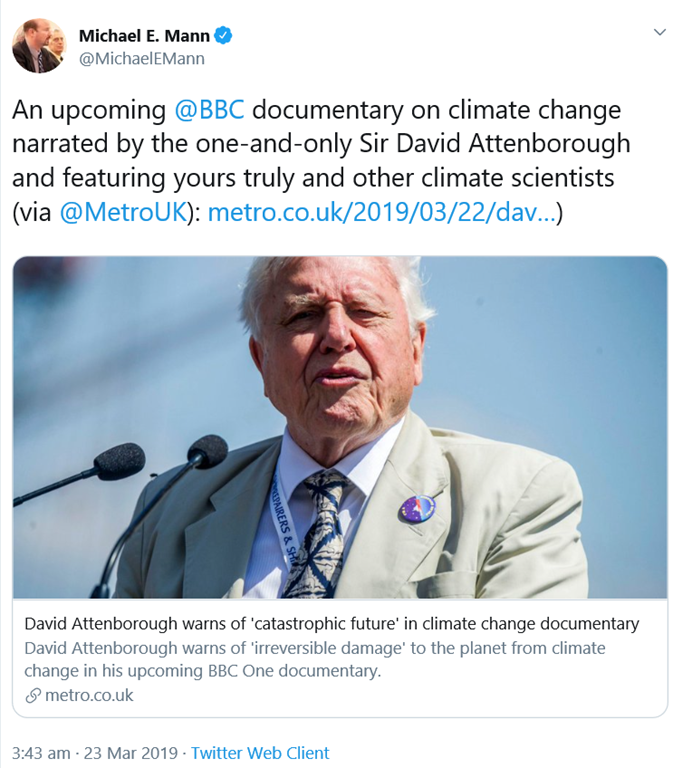 As for the programme, you’ll see film of melting glaciers, hurricanes, floods, droughts and wildfires, backed up by Attenborough’s commentary claiming that they prove climate change. This programme is a work of fiction, and any resemblance to actual facts is purely coincidental. 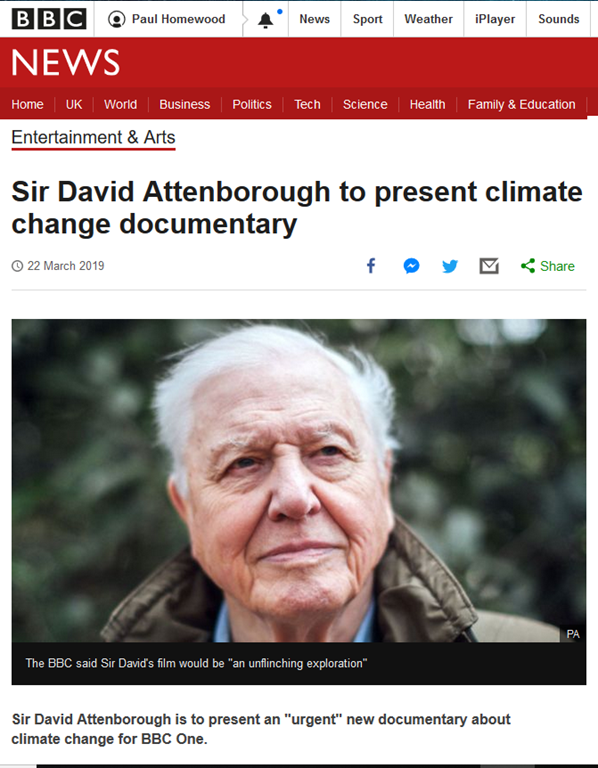 “Sir David Attenborough is to present an “urgent” new documentary about climate change for BBC One”…. Yes another “urgent” plea with no realistic plan to stop this impending “catastrophe”. No time frame, no costs. Just do it! And quickly. Hopefully, Prince Charles will have a walk on part explaining how well his ‘100 months to save the planet’ strategy is going. Seem to remember it was a tad more than a 100 months ago that he first made that claim and, miraculously, we’re all still here. Blimey, who’d have thought it? Well, actually, anyone with even the tiniest appreciation of historic weather and climate patterns and human civilisation methinks. But, it’s ok, some American sixth form student, called Occasional Cortex, has just given us an extra 120 months to save the planet. Phew, a lucky escape it seems. Will Sir David grasp that nettle? I wonder whether he will mention the Polar Bears? There will, of course, be no need to interview scientists with sceptical views on the subject because the BBC has decreed that as “the science is settled” they are all condemned as ‘Deniers’ and not worthy of BBC time. And Attenborough calls himself a broadcaster? Effing Scum Bag. Surely, this is a golden opportunity for the scam to be challenged, countering his claims one by one and showing him just to be one of the “useful idiots”? The Mail had a load of inaccurate drivel about polar bears – see Dr Susan Crockford’s excellent book for the truth – and featured Attenborough. At the end of Blue Planet Two we had Attemboro’ and fizzing acid seawater and a call to give up fossil fuels with windmills in shot. The poor deluded fool. Who is responsible for that? But…but he is old…and white…and male! I really do not understand Attenborough. He is by education a geologist. While I had a good education in botany at West Virginia University, receiving my BA in 1966, it was limited in an understanding of the scope of the subject. My MA and PhD’s from The University of North Carolina at Chapel Hill greatly expanded my knowledge and view of things botanical. One of the most fascinating aspects was geobotany. During my PhD work, I had a Devonian paleobotanist on my committee and took several courses in not only that but geology. Those latter experiences gave me a tremendous understanding of climate, its changes over time, the movement of continents (the tremendous effect on weather due to that) and the subsequent distribution of whole floras. Sir David has missed out on this wider view even though he may “read” it during his shows. I had one of his books which accompanied a series he did in the 1980’s. Several years ago when he began mouthing the need for people such as myself to die, I removed it from the shelf to my large brush pile and returned it to the carbon cycle. Nah, the IPCC has coined that one already. They feel the need to as even they can see – and fear – there’s a long cold spell coming. They don’t want to lose the initiative. They’re lying for their country (except the vision of the country they want is not mine – vision or country). I’ve come to the same conclusion Harry. 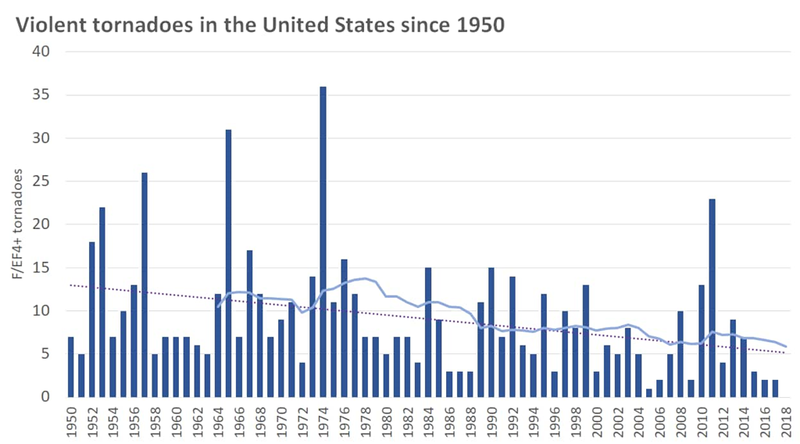 The avalanche of hysterical propaganda is a clear indication that the word is out that a prolonged cooling is looming on the horizon. 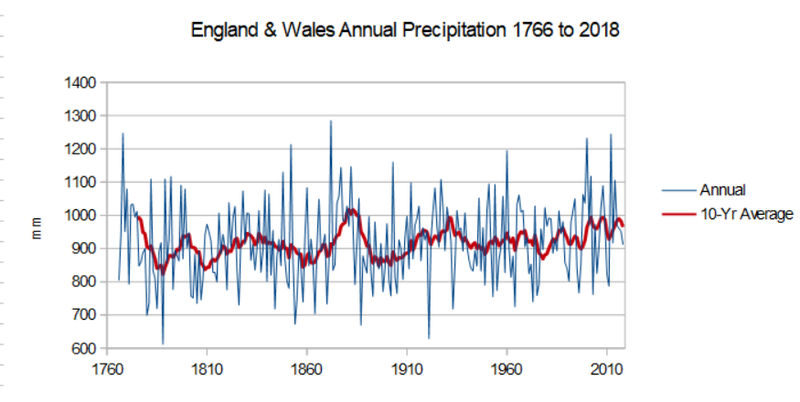 The Telegraph was at it today with predictions from “forecasters” that the UK was going to have its hottest Spring evah! I’ve checked a number of different forecasts for London which one would expect to be the mildest part of the UK and while it is predicted to be relatively dry, temperatures are predicted to be about average – low to mid teens up to mid May during the day and chilly nights. Paul might want to remind the Telegraph in due course! Ironically a recent BBC series about Patagonia (the Andes) made me realise what a crock of s**t is the environ-mentals (sic) main marketing message, that mankind is trashing Planet Earth. Just start with Antarctica, where mankind is making zero impact, then consider each continent, South America, Africa, etc and it dawns on you that man is still puny in comparison with all the vast wildernesses. Yes, puny man can degrade the areas he lives in, but what stops that is wealth, which comes about from … fossil fuels, plastics, and capitalism. ” One off” like all their alarmist scare stories. Including a beardy liar and a fraud however says exactly what this is and who the BBC see themselves as. In any other area of scientific endevour that man would have been sacked in disgrace. In the climate industry he gets a professorship! Do you mean Piltdown Mann? So the programme will focus on possible solutions. Well, as Sir David presumably believes that the overriding solution is the urgent and substantial reduction of greenhouse gas emissions, a major focus should be on the harsh reality that developing countries (responsible for over 65% of emissions) show no interest in emission reduction – despite 20 years of attempts by US and EU negotiators at UN climate conferences to persuade them to change their minds. I hope the programme will include “an unflinching exploration” of how that “challenging issue” might be overcome. But I don’t suppose it will. He can pose as a fake climate expert if he wants, but the flak is coming . Perhaps Paul you should write to the BBC warning them in advance that you will be examining the evidence for all the claims they make about climate change. How many miles will he fly this time? As far as I have read this programme has not yet been made. Perhaps if everyone here lobbied Charlotte Moore by email to the BBC that to ensure balance, as the Beeb is supposedly duty bound to do, comment should be invited from the likes of Richard Lindzen, Judith Curry etc. The receipt of a substantial number of requests so to do would surely merit a response. Unless someone wants to start a petition that those here interested can add their digital signature to, I’m afraid that’s beyond my media abilities though. Don’t give them the opportunity to manipulate the opposition by editing. Very good point – they hold all the cards on the content of the final programme. “Humanity’s greatest threat,” and no one even know what it means. His documentaries have become clownish. President Donald Trump’s speech to the UN was a barn-burner which leaves David with his “Sir” in the dust. Fact0check it. Rest assured they won’t be able to help themselves so it WILL be a work of Green Blob propaganda fiction. For you it will be an open goal. 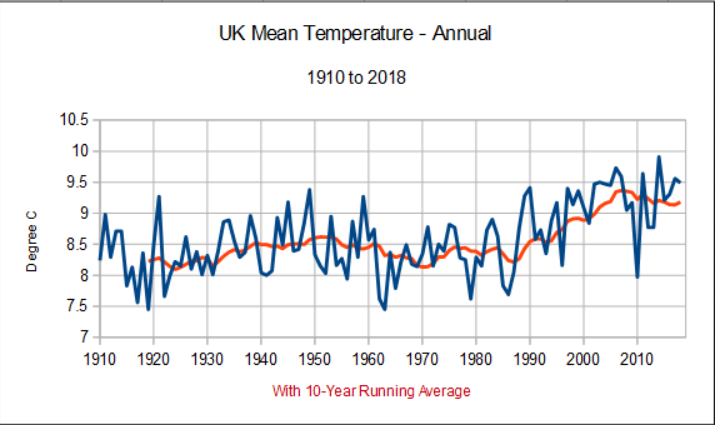 Suggest Paul applies his expertise to the first ten minutes of yesterday’s “Woman’s Hour” where an environmental campaigner was allowed to get away with saying that projections of climate change depended on computer simulations and the actual rate of warming was much worse that the computers made out. It’s rather like Hindenburg being trotted-out by Hitler as a sign of authenticity. Poor old David, the go-to BBC veracity-ometer. How to spoil a well-intentioned and wholly admiral existence, voicing-over the diligent, dangerous and often technically superb work of others. I am reminded of the peril for swathes of wildlife is in those supposedly good works such as conservation with their add mix of anthropomorphism. There seem to have been a whole slew of instances within the last year where creatures ‘saved’ from the wild have escaped captivity only to be shot or otherwise dispensed with on the pretext of their danger to the populace, forgetting that there are some places where the same creatures roam freely which can’t be any danger to anyone, can they? The RSPB has been at its most activist in a period when numbers of all avian species have been in their heaviest decline. Those people have reserves that resemble ‘bird world’, a sort of sanitised example of real environment for the delectation of the public. Where foot-fall is encouraged and the creatures can only be said to be living if there is an RSPB shop and extensive walk-ways and vantage points, limiting the space for the creatures and probably scaring-off flocks of things that prefer anonymity. Whatever perils animals face in their natural habitats whatever end they meet will be, by comparison, more dignified than being yanked out of your familiar and murdered in suburbia. 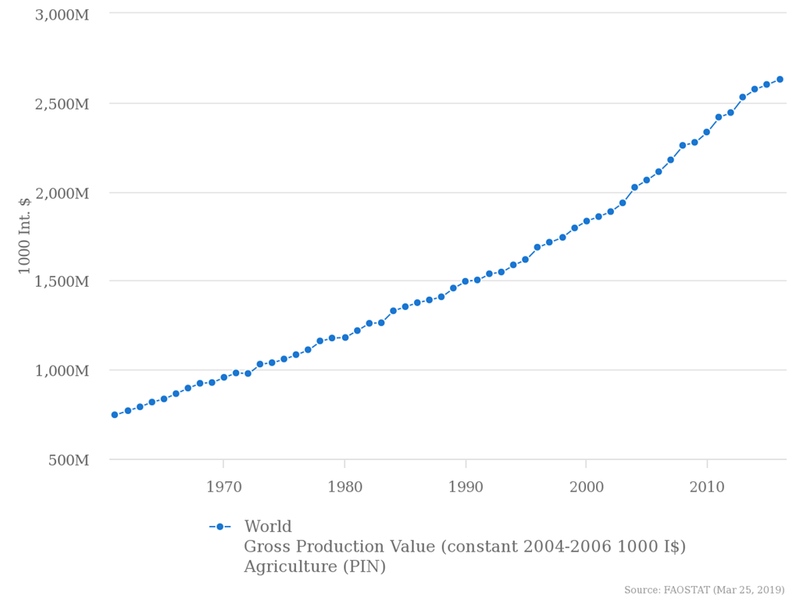 They will be in keeping with the actions of governments who constantly profess the need for larger populations. Could you imagine this man castigating the development plans of any government in any of these exotic places that he visits? There is an inherent false premise here, the need for the evolution of nations. Criticism being off the table then the only answer to his plight has to be some other factor so why not AGW? In our own country his politics would be predictable. He would be an advocate of the great housing splurge (as he is a sensitive and caring sort of bloke, I mused). In recent times we have seen this country developed to death. Britain has become a place where any scrub/marginal land is obviously in need of housing (the sorts of places that animals love). The Labour Party enshrined the right to walk the coast ignoring private property and abolishing trespass virtually. Another habitat where the great need to see that which we love inevitably destroys it. As long as the BBC does not broadcast its retractions and has only a filter on what it suggests is contentious, and then only has talking heads answering questions that they may well have framed themselves, we are lost. 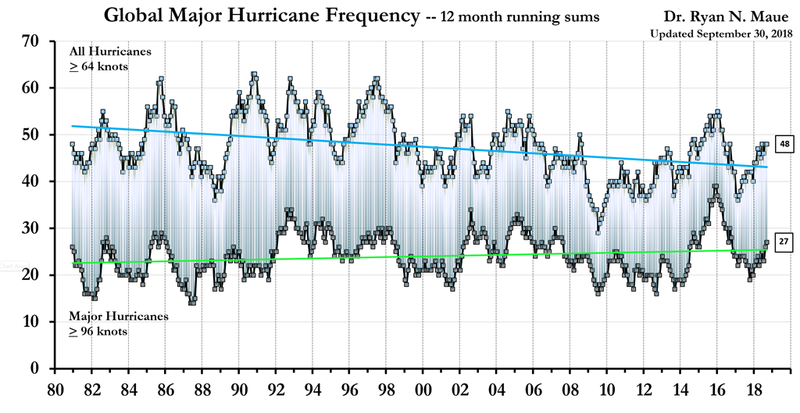 And all the time we have to remember that AGW, in their estimate, is real and undeniable and will not brook any contrary opinion. A cast iron case of talk to the hand. “Most of the fish they rely on to feed their chicks have moved 300 miles east, most likely due to over fishing and climate change affecting ocean temperatures”. So BBC have change the message slightly but still include “climate change” as one of the reasons for the decline in numbers of fish. It would have been useful to have information on the relative effect of over fishing versus warming oceans. About 44 minutes into the programme. It’s a pity these blogs aren’t linked through to Facebook, Twitter etc. as how else can they reach climate change believers who form the great majority? I told you to clear your diary days ago – should be a good few complaints to be made! Is there a smell of desperation in the air from the alarmists? 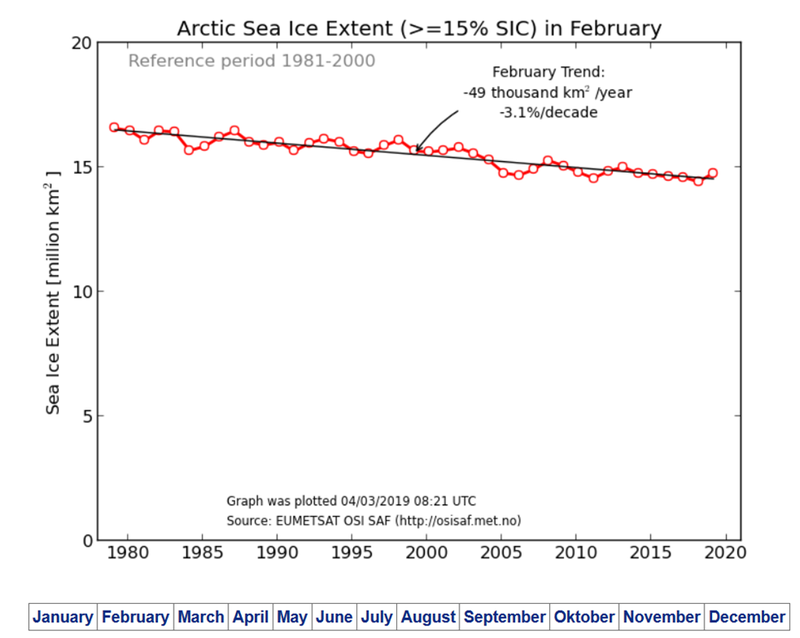 Their cosy taxpayer funded world is under attack from reality – the start of the cooling – and from Donald the Great and his presidential science committee. They are even throwing the kids into the battle. and the BBC found so many “mistakes” in his documentary “Human Planet ” that they withdrew it from distribution. The man is an anti-human racist who makes documentaries so “mistaken” that even the BBC won’t show them. The public should be reminded. A lot of us grew up listening to Attenborough’s soothing voice. it’s a voice that people will accept readily, insidious brain washing. Yes we do have a responsibility to protect our planet, so are they going to ban Monsanto? Sir David has a degree in geology. Since then, like his brother, he has made films, and caused films to be made, for the BBC. In many of these he has taken a front man role without actually having done much of the hard graft or research. He has been very good at this and drawn large and appreciative audiences. That is his talent: find a good story, build it up, employ top drawer camera crews, edit it meticulously with lots of slow motion, many studio shots, a little slight of hand and sell it lavishly. He is not doing science but is a TV executive who knows his market and is squeezing it for every drop of blood. Like Hollywood films about history a little economy with facts is used to help the story along. That is what he does and is brilliant at it. You have to admit it, accurate or not, all his work is beautiful and certainly has shown me many things I would not otherwise have not have seen. I am perfectly capable of judging his propaganda for myself. I don’t believe Star Wars is real either, but hugely enjoy it. Ref the rising sea level, has anyone done a study of the extent to which this could be prevented if some of the areas of land below sea level were flooded by building canals to them from the sea?